Ski-Doo News and Reviews from snowmobile.com, including reviews of the new 2010 Summit, MX-Z, Expedition, and GSX 600 E-tec sleds. Arctic Cat News and Reviews from snowmobile.com, with opinions on the new 2010 M1000 Sno Pro and M8 mountain sleds and F8 and F5 LXR performance machines. Polaris News and Reviews from snowmobile.com, with words on the new generation 600 & 700 RMK and Dragon for the high boondockers, the IQ Turbo Dragon for those with a need for speed, and the 600 LX touring snowmobile for a luxury ride. Yamaha News and Reviews from snowmobile.com, including the new FX Nytro MTX SE mountain powder explorer, the Venture GT touring sled, and Nytro RTX trail rider. Specialty and Vintage Snowmobile News and Reviews from snowmobile.com, currently featuring a review of a 1968 Sno-Skat, a kit-built 180 lb very simple and low-profile sled. They were powered by whatever engine a person bought off the shelf, typically a 5 hp Briggs and Stratton. It's just like a kid's go-kart for the snow, and must have been a blast in 1968. Also featured is a 1972 Coleman-Skiroule RT, with a discussion of how offbeat genius designer Tony MacKeen used to sculpt his ideas in foam to get an idea of the three dimensional interaction of components. Snowtech magazine is a subscription publication, but they have a good deal of content on their website for those who have not subscribed, including an article about Star-Tron enzyme fuel conditioner and ethanol fuel problems in snowmobiles. SUPERTRAX Magazine is loaded with features from every facet of the snowmobiling lifestyle, from racing news to industry developments and the latest consumer sleds and gear to tech tips from motor head and sledding tourism destination reports. Max Sled Magazine has quality reviews of the latest models from the big four snowmobile manufacturers. High performance sled racers will appreciate the racing news and events found at SnowGoer Racing, following the latest news with ORA, the Oval Racers Alliance and other topics of interest to hot rod sledders. American Snowmobiler is a huge resource for snowmobiling culture, but you have to subscribe to get the best content. Probably worthwhile if you are interested in sledding! SnoWest Forums has something for everybody, with manufacturer-specific forums and forums for discussion of every type of sledding. No matter what your question, someone there will share the answer. The HardCoreSledder Forum is exactly what the name says: a gathering place for extremely obsessed sledders. 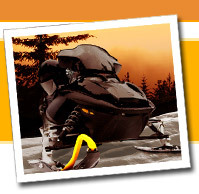 For all things Ski-Doo, check out the DooTalk Forums. Sledder's Vision snomobilers are active in charity events and getting positive exposure to introduce new people to the fun of snowmobiling. They also have the Emergency Room technical discussion area, where the rules say you must post with your hands dirty and your sled in pieces. Pity the keyboards! Snowmobile Forum from snowmobile.com is a very active place with lots of informative sub-forums as well as a good used parts and sleds classified advertising section. If you are new to snowmobiling, be sure to learn the snowmobile hand signals and trail etiquette to keep riding safe for all. Snowmobiles are fast and not that easy to maneuver at times, so it's best to let other riders know what you and your group are doing.